THE TEERITZ AGENDA: Friday 4/11/2016 - Cup Day Bets, De-Cluttering & This Week's (New!) Wristwatch. Friday 4/11/2016 - Cup Day Bets, De-Cluttering & This Week's (New!) Wristwatch. Started the week by going in to work for a few hours. I had the option of taking the day off and, while I had taken this option, I later learned that there was a particular chore that none of the other staff could tackle, so I offered to go in and deal with it myself. While there, I figured I'd do a little catching up on the work that had piled up while I was on leave last month. A fellow collector got in touch with me and offered me a 1990s Omega Speedmaster bracelet for a ridiculously low price. Brand new, these bracelets sell for around seven hundred dollars. I can get two nice vintage Longines watches for that kind of money. He was looking to offload it for $150. How could I say 'no'? I saw this bracelet on his own Omega Seamaster 300 and it looked outstanding. So, I transferred some dough over to his account. He told me he would get it in the mail to me asap. The first Tuesday in November is when The Melbourne Cup is held each year, a horse race which attracts people from around the world. I hadn't paid much attention to which horses were considered the favourites for this year's race, but then, that's never stopped me in the past. Of course, if I was gonna be a punter for the day, I had to dress the part. A change of wristwatch was needed. And a hat. I switched over to the Longines Expeditions Polaires. It's currently on a cheap and nasty faux lizard skin strap. I'll have to snag a proper one at some point because it smartens up the watch quite a bit. The bracelet fits the watch about 95% perfectly. Obviously, since it's made for a different model, it's not an exact fit in terms of height. It sits just a tad low compared to the thickness of the watch case. However, there's little or no 'play' in the end-links where they join up to the case and it all feels sturdy enough. I think this bracelet will stay on this watch for a while, despite the fact that the clasp has 'Speedmaster' engraved across it. I can live with that. Got some stuff currently selling on eBay and I've already had to contend with a few low-ball offers. No matter. I just have to keep my mind on the big picture, that being that I'm clearing things out in an effort to de-clutter a little. I have a trolley in the dining area crammed with wristwatch magazines that I've accumulated over the years. I'm gonna try putting a few on the 'bay to see if they'll sell. If so, great. If not, then I think I'll either take them to a thrift store or toss them in the paper recycling bin. Thursday, I picked up a new watch. I'd been squirreling the bucks away here and there for the past year or so and I didn't splurge on things during my recent trip. This watch had been released earlier in the year and I thought it looked intriguing when I first saw photos of it on the web. When I saw it in real life, though, it looked even better. The Oris Diver 65 was unveiled at the BaselWorld Watch Fair in March last year and it generated a lot of interest among watch fans and collectors. Based on a dive watch model of theirs from 1965, it was a faithful reproduction, with the main concession to modern tastes being a slightly larger (but still small by today's standards) 40mm case, as opposed to the 36mm diameter of the '60s original. The 36mm original seen here in the left of the frame, the new version on the right. This new model has sold very well since its release 18 months ago, and Oris has since brought out another re-edition based on an older model, although this new one is 42mm in diameter and has a more conservative dial design. I briefly considered the black dialed model when it was first released, but when Oris quietly launched the two-tone blue and black dialed version this year, my mind was made up. Looking at my collection, I already have enough black-dial sports watches over 40mm in diameter. The blue & black dial model would offer some differentiation. And its 40 mil size would sit nicely on my wrist, which seems to have gotten thinner in recent months. Gotta get back to the gym! Anyway, I bought it, got it home, sized the bracelet, and pow! The bracelet has been knocked by detractors who have said that it 'borrows' a little too heavily from the Rolex Oyster bracelet design of the 1960s, but that's part of its charm to me. The deep metallic blue outer dial tends to light up in natural light and the black inner dial disc provides a nice yet subtle contrast. In artificial lighting, the dial tends to look black. The domed sapphire crystal distorts the funky, Lost-In-Spacey/Thunderbirds numerals a little, giving the impression that its a vintage mineral crystal on this watch. Admittedly, the numeral font was a bit of a deal-breaker for me until I accepted the fact that they add to the overall vintage look of the watch. Once I got that through my head, I began to appreciate the dial and numeral layout more. For me, the beauty of this watch lies in the fact that it's such a close reproduction of the original design. 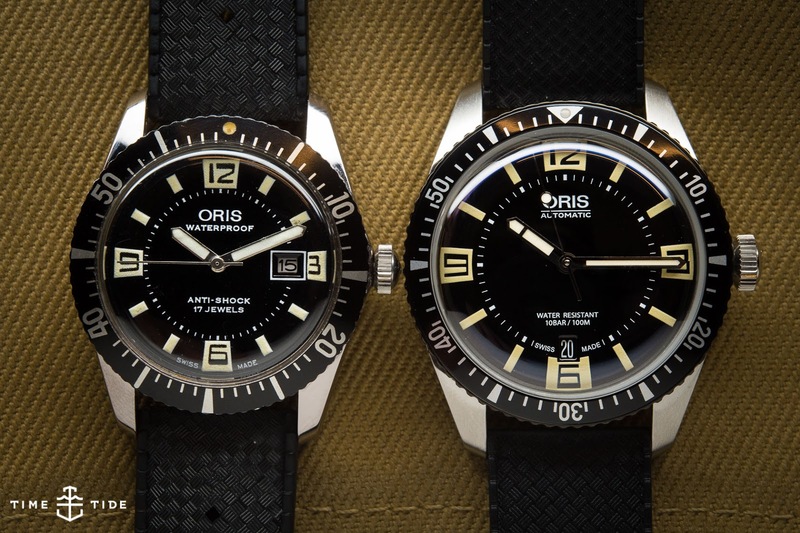 This is something that Oris tends to do when it produces a re-edition. This watch company sticks very close to the original. Anyway, gang, that's another week down. I think his cold of mine has finally gone...to be replaced by hayfever now that Spring is here. Not the worst thing that could happen. Friday 11/11/16 - Short One This Week.